30 www.coalage.com March 2017 plant engineering continued overhead and we are in the process of re- building that business from an aggressive 'right sizing' process that began about a year ago." Timing is, as they say, everything, and now more coal operators are considering projects again. "We have seen a resurgence in metallurgical coal," Carvelas said. "We are currently working on two execution projects: the Donkin project in Nova Scotia and a significant project in Australia. We are engaging in a number of other coal projects in Africa, USA, Canada and Australia, and we plan to remain the dominant player in this sector." Securing the Australian project allows DRA to break into the Australian coal sec- tor. "For years, Sedgman had the Australian market wrapped up and this is a big step forward for us," Carvelas said. "It has put us on the map in Australia. We have a few other initiatives under way to build capaci- ty and credibility in Australia." The Donkin coal project, owned by U.S.-based Cline Group, began producing metallurgical coal in January. Located on Cape Breton, Donkin at one time operated longwalls beneath the Atlantic Ocean. The new Donkin operation is now projected to produce at a rate of about 2.75 million metric tons per year (mtpy) by the close of 2017 using room-and-pillar mining. It has enough crossover met-quality reserves to last for at least 20 years. "We consider ourselves a global engi- neering company and a global operations company," Carvelas said. "We offer full life cycle service for a mining facility, not just the project engineering and construction. We get involved early with feasibility and concept studies and follow the project right through to detailed design and detailed engineering and then construction, commissioning and commercial operations, if needed." DRA currently operates 32 facilities around the globe. "We believe that is a sig- nificant differentiator for us," Carvelas said. "Only a few mining companies can say that they operate 32 facilities around the globe. Some of these are coal assets, but others are producing iron ore, platinum, diamonds and gold. The strategy now is to increase the enterprise value by 2020. 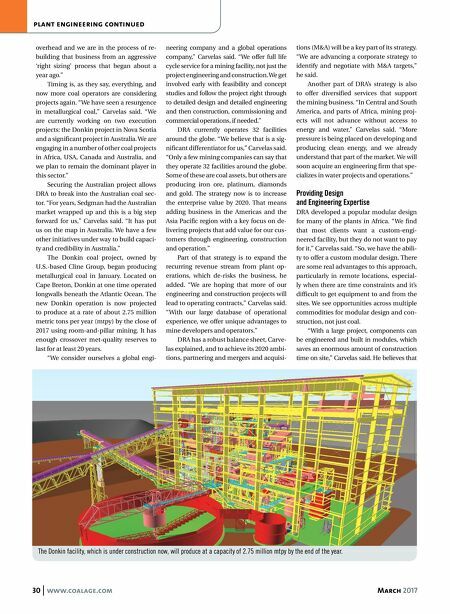 That means adding business in the Americas and the Asia Pacific region with a key focus on de- livering projects that add value for our cus- tomers through engineering, construction and operation." Part of that strategy is to expand the recurring revenue stream from plant op- erations, which de-risks the business, he added. "We are hoping that more of our engineering and construction projects will lead to operating contracts," Carvelas said. "With our large database of operational experience, we offer unique advantages to mine developers and operators." DRA has a robust balance sheet, Carve- las explained, and to achieve its 2020 ambi- tions, partnering and mergers and acquisi- tions (M&A) will be a key part of its strategy. "We are advancing a corporate strategy to identify and negotiate with M&A targets," he said. Another part of DRA's strategy is also to offer diversified services that support the mining business. "In Central and South America, and parts of Africa, mining proj- ects will not advance without access to energy and water," Carvelas said. "More pressure is being placed on developing and producing clean energy, and we already understand that part of the market. We will soon acquire an engineering firm that spe- cializes in water projects and operations." Providing Design and Engineering Expertise DRA developed a popular modular design for many of the plants in Africa. "We find that most clients want a custom-engi- neered facility, but they do not want to pay for it," Carvelas said. "So, we have the abili- ty to offer a custom modular design. There are some real advantages to this approach, particularly in remote locations, especial- ly when there are time constraints and it's difficult to get equipment to and from the sites. We see opportunities across multiple commodities for modular design and con- struction, not just coal. 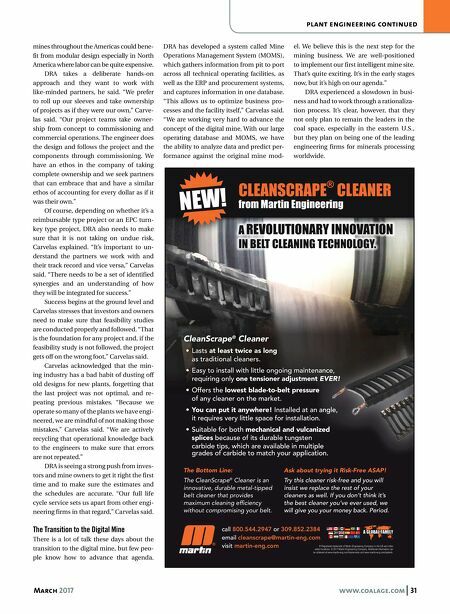 "With a large project, components can be engineered and built in modules, which saves an enormous amount of construction time on site," Carvelas said. He believes that The Donkin facility, which is under construction now, will produce at a capacity of 2.75 million mtpy by the end of the year.